Lab rat doing a ring pull as part of the Operator Ulysses training plan. We recently published four new training plans which reflect our latest programming theory for military and mountain athletes. On the military side, just published are two plans in our “Greek Hero” series. The first, “Ulysses” is the fourth plan in the series following Hector, Apollo, and Achilles. Ulysses has a subtle endurance emphasis – specifically loaded running and ruck running. Like all the plans in the series, Ulysses also trains strength, work capacity, TAC SEPA and Chassis Integrity. On the strength side, Ulysses focuses on lower body, single leg work and the posterior chain. 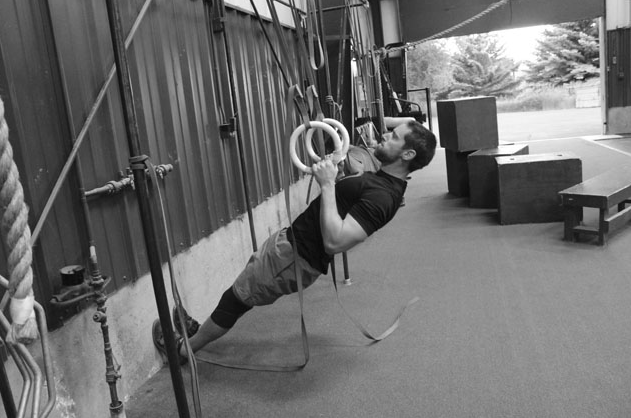 Upper body work is bodyweight only. Work capacity is short, and gym-based. Also published this week is “Perseus.” Perseus is a balanced cycle, without any cyclic emphasis. Perseus unloads some on the endurance side, and combines 45# ruck running and unloaded running. The strength work deploys our TLU progressions – every strength session includes a total, lower and upper body strength exercise. Perseus’ work capacity is built around 300m shuttles, bodyweight interval work. Overall – a super solid cycle. We’ve published two new plans in our 5 plan Mountain Base “Greek Heroine” series. As well, these plans deploy our most recent iteration of fluid periodization, and each plan trains strength, work capacity, endurance, chassis integrity and climbing fitness. Artemis is the second plan in the series after Helen, and is a balanced cycle – with no training attribute emphasis. It’s a 6 week, 6 day/week cycle. On the endurance side, Artemis’ focus is uphill movement under load and it includes a step up assessment and follow on progression, as well as long weekend climbs measured in vertical feet. At the top of the cycle your weekend climb will be 4,500 vertical feet at 25#. Strength-wise, Artemis deploys our strength complex theory – a heavy strength exercise followed by one or two complementary fast/explosive bodyweight exercises. Strength complexes train not only strength, but also pure athleticism. Work capacity work is built around 150m shuttle intervals and longer, 20-minute multi-modal gym-based efforts. The climbing focus is stamina – efforts of 4+ minutes on a system board. Also published this week is “Danae.” Danae has a slight endurance emphasis, but the mode shifts from loaded uphill movement to unloaded trail running – up to 12 miles. Strength work is gym based, and free weight focused. Climbing work moves from stamina to work capacity – hard efforts 1-4 minutes long.